Greetings from Bempton Cliffs. November is upon us, the nights are drawing in and before you know it will be the New Year. Don’t worry if you haven’t made a trip up to Bempton yet this year though, we have a series of great events planned during the winter months. Every Friday until the 5th of February we will be hosting a special guided walk. Through November these will be focusing on the spectacular geology of the reserve. There’s more to those towering chalk cliffs than you might think. Why not join our walk leader, Paul Hildreth, to find out everything you’ve ever wanted to know about the cliffs that house over 250,000 seabirds. I’ve tagged along on one of these walks myself and I can tell you that it is well worth making the effort to come and join in. I learned more in that hour and a half than I have in a very long time. Have I mentioned that a hot drink and a slice of cake are included in the price? We’re catering for the youngsters too. 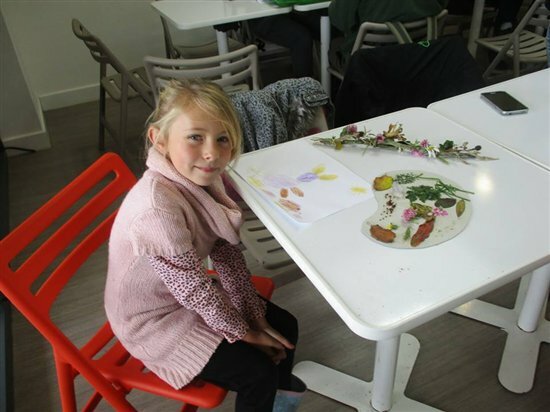 We will be hosting six sessions of ‘Nature’s Little Helpers’ throughout the winter. You can attend one session or all six but if you come along to all of them your family will have everything required to give nature a home in your garden. 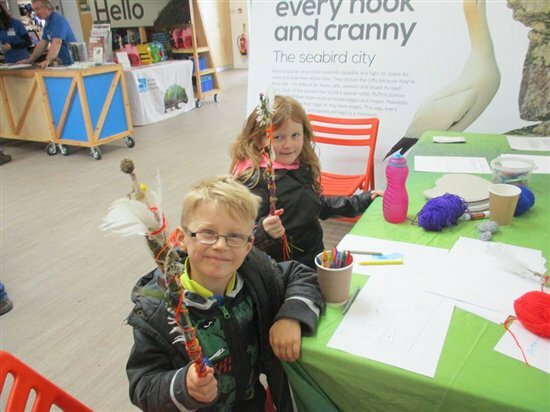 Speaking of activities for kids, October half term has come and gone and despite the weather doing its best to deter visitors we still had plenty of families coming to enjoy a day out on the cliffs. We provided a series of activities for children to get stuck into during their visit. My personal favourite was creating a journey stick, a simple and fun way to create a memento of your visit. Also in half term we once again played host to Leanne Beetham, who goes by the name of Lippy Art. Leanne is a talented artist who creates her artwork by holding her paintbrush in her mouth. She came to us during the height of summer and returned again recently to gather inspiration and sell her wares. Exciting news for anybody who is planning to visit us between now and 29th February next year! Entrance to Bempton Cliffs during that time is absolutely free! What a bargain. It’s all part of our plan to attract more visitors over the winter. That’s not all that we’ve done to create a fantastic visitor experience, one corner of the visitor centre has been turned in to a cosy cafe, complete with ‘roaring’ fire. By now you’re probably ready to hear about some of the wildlife we’ve seen on the reserve since my last blog. I won’t keep you waiting any longer. We’re continuing to see redwing and fieldfare in good numbers, along with another winter visitor which for many years has been my bogey bird. 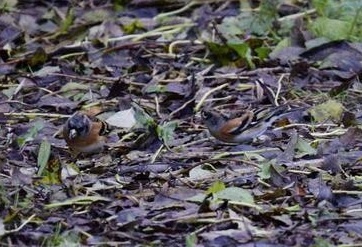 Finally though I can put that hoodoo to rest because on the 11th November I managed to see my first ever Brambling. They’ve been seen frequently on the reserve for the last month or so, I’ve just always been in the wrong place at the wrong time, but finally I managed to see one. I guess I need a new bogey bird now. Any suggestions? On the 1st November we had a truly excellent sighting for the reserve in the shape of a Richard’s pipit. 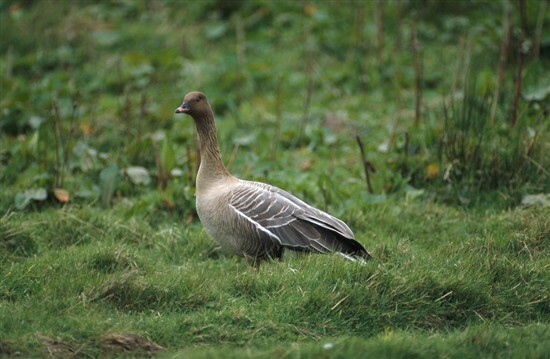 The bird was first sighted in the morning by Grandstand viewpoint before disappearing for a number of hours. Fortunately, news of the sighting had spread by this time and the bird was relocated in the afternoon having moved up to the Dell, at this point we were able to confirm that this was indeed a Richard’s pipit. 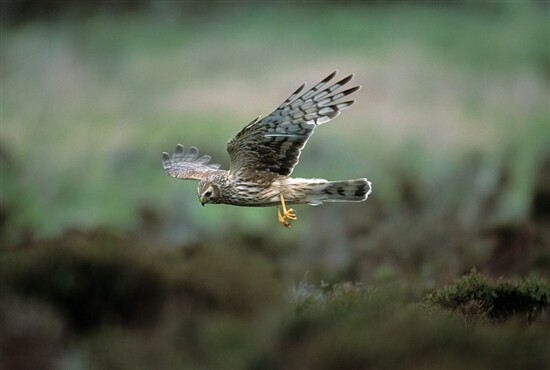 At this time of the year sightings of hen harriers start to become more common along the coast. The birds are moving away from their normal upland habitat in order to spend the winter in comparatively warmer locales. It was on the 31st October that we had our first sighting of the year, a ringtail bird was sighted on the reserve briefly during the day and then again at the end of the day by volunteers Leo Kokoszko and Michael Butler. It was several days before we had another sighting, and what a sighting it was. The Bempton management team came steaming out of their meeting to announce that there was a hen harrier giving great views out of the back of the visitor centre. Management meetings happen every week but such good views of a hen harrier are few and far between. There was one further sighting on the 6th November when a bird was seen over cliff lane. Here’s hoping for more sightings of this wonderful raptor in the coming months. One of my favourite things about this time of year is the movement of wildfowl and we’re starting to see evidence of that. Common scoter were seen heading south in small numbers on the 6th November. At least 50 pink-footed geese were seen flying south on the 1st November, with larger numbers being sighted in the following days. The most impressive movement of wildfowl so far, in my opinion, came on the 11th November when just as the day was drawing to an end we were treated to a flypast by 45 majestic whooper swans. A further 16 followed the next day. Seeing these magnificent pure white birds fly past the visitor centre over the blue of the north sea is truly a sight to behold. 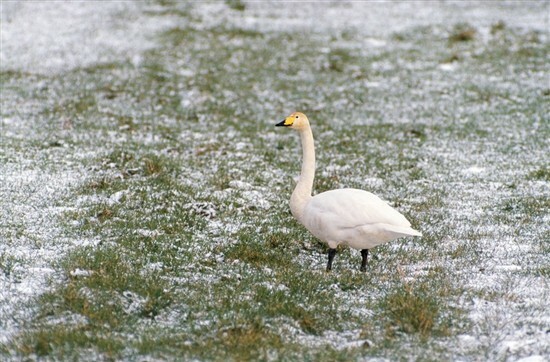 For those of you who are only familiar with the mute swan regularly seen in parks throughout towns across the country the whooper swan is a far wilder animal than it’s orange billed cousin. It may well be one of my favourite winter visitors, then again, I say that about everything.